You are here: Home » News » Smiling At Grief – Double CD – Special Offer! This month’s special offer is the first Definitive Edition CD we released back in 2009 – less than a year after our first reunion shows culminated in a memorable trip to Spain. Disc One includes the first recordings we made with our new singer Geoff Mann, while Disc Two comprises a live show from the ‘world-famous’ Target Club in Reading, recorded in December 1981, less than a year after our ground-breaking instrumental live album. So, for the rest of 2013, and to celebrate the 32nd anniversary of the live show, the Definitive Edition double CD is available at the special price of just £7.50 (about a third off its normal retail price). This double CD features the original cassette release coupled with our own archive release Smiling At Grief Live, and no less than 8 bonus tracks. These include the original demo of Eleanor Rigby, rarities Convenient Blindness and Kindergarden, and a very different early version of This City! As keyboard player Rick Battersby started his ‘sabbatical’ year during the recording sessions he only features on some of the tracks. Although Clive took over keyboard duties, the 4-piece line-up was relatively short-lived – though it did go on to write and record the Fact and Fiction album. 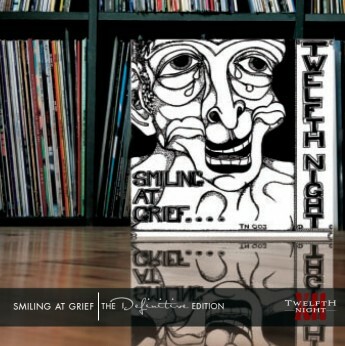 The original purpose of Smiling At Grief had been to gather together some demos to try and stimulate some record company interest and also to satisfy the growing number of fans who had been eagerly awaiting new material, particularly now that Geoff had joined the band. This Festival Music reissue comes with brand new artwork, sleeve notes and previously unseen photographs. It includes three recordings never previously released, and with Smiling At Grief Live as the bonus disc – the only live recording known to exist of the four-piece line up! So, as this is a limited-time ‘web-only’ offer, you know what to do.